If you are interested in getting your hair cut into a pixie haircut there are several considerations you need to take into account before actually going under the scissors and having it styled. Your hair is something that people can see about you from the outside and because of that, you want it to look as good as possible while still fitting into a style and shape that you want. To help with that and the quest for the perfect pixie haircut these suggestions are designed to help you reach hair happiness with as few problems as possible. Choose the style first. There are several different styles of pixie haircuts available. There are the standard short pixie cuts. In addition, there are also the choppy styles, the shaggy styles, and even some boyish inspired styles. No one style is perfect for everyone, and no one style appeals to everyone. You should look around at some pictures to decide which style you are most interested in before going to get the actual cut. Once you have selected a style that you think you will like, start looking into the maintenance needs of it. 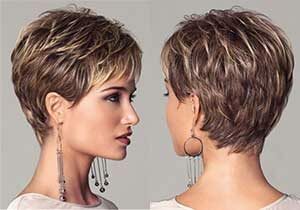 While a standard, short pixie haircut is the traditional style and very low maintenance it does require frequent trimmings in order to keep the style looking sharp and clean. A slightly longer choppy or shaggy pixie haircut is not as needy for trims, but is typically more needy on styling time to create the perfect look. Balance your needs for style with the amount of time you can devote to maintenance and styling to have the best possible experience with your pixie haircut. Another important consideration is being very careful if you are considering a boyish pixie haircut. Many women look very much boyish when they have this haircut. If you are considering this cut, you should talk to your stylist first to get their professional opinion about the finished product. If you are simply seeking out a very short style without the boyish appearance they can work with you to create a great modified pixie haircut that will fit your needs without making you appear boyish. A great pixie haircut is the perfect accessory for going anywhere and any outfit. Styled and cut appropriately many people are quite happy with a great pixie haircut and happily keep the style for a very long time. These tips are designed to help you achieve the pixie haircut happiness that you have been looking for, without the worries of a bad haircut. So enjoy the new hairstyle with pride.